Where is there a comparable virtue? Where is there even such a friend? Where is there merit similar to this? The bodhicitta mind is the most powerful amongst all virtuous states of mind. Nothing is comparable to its strength and power. It can remove all the sufferings of all sentient beings and establish them in the state of bliss. It is able to provide sentient beings joy and happiness and remove the darkness of ignorance from their minds. When we praise bodhicitta as being the most powerful mind, capable of removing the ignorance that obscures the minds of sentient beings, how does this work? We should understand that the bodhisattva, with his strong bodhicitta mind, considers our condition. Since we sentient beings are ignorant with regard to what should be abandoned and how to abandon that and what should be cultivated and how to cultivate that, the bodhisattva teaches us these points without mistake. This is how the bodhisattva removes our mental ignorance. Bodhicitta is also praised as an unequalled virtuous friend. Here, one can understand a virtuous friend to mean a good friend. The bodhicitta mind is praised as the most supreme amongst our virtuous friends because it is able to protect us from all harms and enable us to accomplish benefits, not only for ourselves but for others. This verse also says that there is no merit comparable to bodhicitta. This means that, by relying upon bodhicitta, one can easily accumulate extensive amounts of merit and will continue to do so, from moment to moment. Having the bodhicitta mind naturally causes us to engage in virtue and to pacify all negativities. It is mentioned that as long as we have the bodhicitta mind, we will continuously generate merit even when we go about doing our usual activities such as sleeping, walking, sitting and so on. Therein lies the power of the bodhicitta mind. Since we aspire to attain buddhahood, we need to accumulate merit and the supreme method for doing this is through the practice of bodhicitta. Therefore, we should contemplate over and over the inconceivable benefits of bodhicitta, till the aspiration to generate bodhicitta arises in our minds. Realising the need to cultivate bodhicitta, we will be inspired to put in every effort to do so. We should pray continuously to generate bodhicitta within this lifetime and also to rely constantly on effortful and sustained practice. By remembering that the bodhicitta mind is the most powerful virtue, the most powerful friend and the most powerful merit, we engage in listening to the Buddha’s teachings with the intention to practise and cultivate it. Due to the force of this motivation, we receive infinite benefits from listening to the teachings and are also able to do so with a joyful mind. Into the priceless jewel of a Buddha-Form. When we achieve the state of full enlightenment, we will be in a position to fulfil all the hopes and wishes of sentient beings and help eliminate all their sufferings. What would enable us to achieve this state? It is generating bodhicitta in our minds. The bodhisattvas take rebirth in samsara, using their unclean, impure bodies to benefit others, unlike the hearers and solitary realisers, who abandon their bodies to get out of samsara, in pursuit of their personal liberation. The bodhisattvas are able to take on such samsaric rebirths for the benefit of others due to their great compassion and complete abandonment of self-cherishing. The hearers and solitary realisers are unable to do so because they are not free from their self-cherishing attitude. When self-cherishing is absent, one is able to work solely for the benefit of others, so the weaker one’s self-cherishing is, the greater will be one’s ability to benefit others. The stronger one’s self-cherishing, the more difficult it will be for one to work for others. Basically, it all boils down to whether one has bodhicitta or not. So, we should try to develop bodhicitta and once it is generated, strive to ensure that it does not decline but work to strengthen that virtuous mind. These verses from the Guru Puja show that even when all sentient beings turn against us, instead of returning harm for harm, it is actually possible to develop patience when there is bodhicitta in our mental continua. When we train our minds in the method of exchanging ourselves for others, we develop loving kindness and compassion for all sentient beings, which then enables us to behave in the manner mentioned in these verses. When we look at such verses, we find it very difficult to comprehend that such a thing is possible; it is just beyond our mental capacity. We think in this way because we have yet to develop bodhicitta in our mental continua. Once we have generated bodhicitta, instead of being disturbed, our minds will remain very calm and we can work for the benefit even of those who harm us. With bodhicitta, we will also be able to develop the kind of joyous perseverance that is mentioned in the Guru Puja. We will have the courage, determination and the joyous perseverance needed to benefit other sentient beings. Whether the practice of the perfection of patience and joyous perseverance can be cultivated in our minds depends on whether we can develop the altruistic intention, bodhicitta. Bodhicitta is a mind that cherishes others more than oneself, forsaking one’s own purposes and placing others’ welfare before one’s own. Because the bodhisattvas have such unbearable compassion for sentient beings, they have tremendous determination and are able to work with a happy mind for countless oceans of eons to help just one sentient being. We find it difficult now to work for the benefit of even one sentient being because we do not have such a mind and we become easily discouraged. The opposite happens when we have bodhicitta. Then, even if we had to spend an eon to benefit a single sentient being, we would happily do so. Whether we are able to develop these perfections depends on whether we are able to develop bodhicitta in our minds. Until that time, even when we do practise generosity, it will not become the perfection of generosity. Shantideva said that bodhicitta is the cause of happiness and joy and is like the great medicine for all sentient beings of the six realms. When we are able to develop bodhicitta in our own mental continuum, we can obtain the higher rebirths of humans and gods and progress from there towards liberation and full enlightenment. Bodhicitta is also like the medicine that eliminates all our sufferings. Once bodhicitta is generated in our minds, our mental sufferings will definitely be reduced. In the same way, when bodhicitta arises in the minds of other sentient beings, they will also be able to reap the benefits of gaining higher rebirths of humans and gods, and the opportunity to achieve liberation and enlightenment as well. You may wonder, “What are the benefits of developing bodhicitta?” The benefits of bodhicitta are inexpressible. In short, bodhicitta is like a wish-fulfilling jewel. It is stated in one sutra that if the benefits of bodhicitta were to take a physical form, the entire space of the three thousand great world systems would not be able to contain it. Bodhicitta is like a wish-fulfilling jewel because it is able to eradicate the poverty of all sentient beings. Our own sufferings will be reduced as we will no longer become the causes for others to generate negative karma and by our causing others to develop bodhicitta, they too can be freed from their sufferings. The bodhisattvas constantly train in the practice of bodhicitta and are not discouraged when they encounter hardships, such as famines, financial difficulties or sickness. Instead, they use these conditions to remind themselves to refrain from engaging in negativities and creating negative karma. They are able to transform whatever negative conditions they meet with into the path of reinforcing and strengthening their practice of bodhicitta. Regardless of the level of hardship, the bodhisattvas will not resort to negative actions or creating negative karma to make things easier for themselves, eg. they will not lose their temper just to get some temporary relief from their suffering. The bodhicitta mind of the bodhisattva is therefore called an extremely precious holy mind. In general, there are different kinds of virtuous minds that we can cultivate or practise. However, this bodhicitta mind is praised as being like a wish-fulfilling jewel that can remove the poverty of impoverished sentient beings. Samsara and the lower nirvana of the arhats are extremes that the bodhisattva tries to avoid. Bodhisattvas are praised as worthy objects of refuge because they are, “that source of joy/Who brings happiness even to those who bring harm.” The true bodhisattva does not retaliate or take revenge against those who harm them. Instead, the bodhisattva makes every effort to establish that person on the path to liberation and omniscient buddhahood. Therefore, the bodhisattva possessing the mind of bodhicitta is praised as the “source of joy” and all happiness. By understanding how bodhisattvas transform all negative circumstances into the path, how they never return harm for harm and how they only strive to place beings in the state of buddhahood, we can see the qualities of the bodhicitta mind. When we are able to generate the bodhicitta mind, we will be able to receive the same benefits as those associated with bodhisattvas. Our bodhicitta becomes the supreme basis for naturally restraining ourselves from creating negative karma. Because we have yet to generate such a mind, presently, we find ourselves creating negative karma all the time. And will be revered by both humans and gods of the world. As soon as bodhicitta is generated in one’s mind, one’s status becomes exalted, regardless of whether one is young or old, male or female. As a bodhisattva, one acquires a different name (a child of the Sugatas) and becomes an object worthy of homage, prostrations and respect by all humans and worldly gods. This happens because of the generation of bodhicitta and not because one had a better rebirth, lineage or gender or was born wealthier than others. One becomes a bodhisattva primarily because of one’s state of mind. The whole purpose of engaging in mind training is to develop bodhicitta, the altruistic intention to become enlightened for the benefit of all sentient beings. There are two ways of doing this; one is by following the seven-fold cause and effect instructions, and the other is by following the instructions on exchanging oneself for others. The Wheel-Weapon text presents the latter system and gives instructions on developing love and compassion through the practice of tong-len, the practice of giving and taking. The main obstacle that prevents us from developing bodhicitta is our self-cherishing attitude. Until that is abandoned, there is no way we can develop bodhicitta. What we are trying to do here is to learn these instructions for developing bodhicitta because when we achieve this, we can overcome our self-cherishing attitude that is the source of all our problems and sufferings. We should pray, “May I and all sentient beings develop bodhicitta. I will cause this to happen by myself alone. Please, guru deity, bless me to be able to do this.” We are adapting the prayer of the four immeasurables and substituting the words for developing bodhicitta. When we pray, “May I and all sentient beings develop bodhicitta,” that is only at the level of prayer. Although it is important to pray for this, we will never get anywhere by leaving it at this level. It is impossible to develop bodhicitta in this way. We should remember this motivation and aspiration when listening to the teachings on the instructions for developing bodhicitta. When we do this, it will be of great benefit. When you finish your work or as soon as you are about to set off for class to listen to the teachings, you should immediately generate this motivation. Quickly generate the thought, “I am going to class to learn about the instructions to develop bodhicitta.” With this motivation, each and every single step we take towards the centre causes us to accumulate an immeasurable amount of merit. When you are in class, you should again generate this motivation, “I am listening to these teachings because I want to learn how to develop bodhicitta.” As you listen to the teachings, pay attention and keep this motivation very close to your heart. As mentioned in the first chapter of Engaging in the Bodhisattva Deeds, when it comes to purifying any kind of negative karma, even the heaviest karma, there is nothing more powerful than developing the mind of bodhicitta. Most of the verses in The Wheel-Weapon state that the real problem is our self-cherishing attitude. Whatever problems we experience are the results of the karma we have created in the past under the influence of our self-cherishing attitude. If you are looking for someone to blame, blame the self-cherishing attitude. The instructions say that other people are actually very precious and kind. If there is a problem, then it is our own self-cherishing attitude. Most of the verses also point out how the different kinds of sufferings are the results of our own karma, “It is the weapon of my own evil deeds turned upon me.” We try to take all these unfavourable conditions into the path and throw them at our self-cherishing attitude to try to reduce the strength of this self-cherishing attitude. When we read the text, The Wheel Weapon, we may feel that everything we have been doing had been inappropriate or wrong. It is natural to feel this way because the purpose of this text is to point out our faults, the mistake of not having a bodhicitta mind. We should understand that what this text is trying to tell us is that, without the mind of bodhicitta, naturally we would always remain sentient beings with faults. Therefore, when we read mind-training texts that seem harsh in this way, we should not feel discouraged or depressed. We should understand that it is natural for us sentient beings to have faults. However, we should move beyond just seeing our faults to understand the true purpose of having our faults exposed in this way. We should strive to generate bodhicitta because, as long as the bodhicitta mind is not present, our faults will remain. This text explains the practice of bodhicitta. Since we are not bodhisattvas yet, it is only natural that, at our level, the practice seems to be very difficult. The main purpose of this text is to inspire us to work for the generation of bodhicitta. This text tells us over and over again that the more powerful our egoistic mind, the more faults we incur. Therefore, it advises us to be inspired to reduce the intensity of that egoistic mind and, instead, to nurture the mind that cherishes others. Yana 11 is not the carrier or what is carried—it is the carrying. Thus Hinayana means "carrying the smaller load," and Mahayana, "carrying the great load." Hinayana practitioners are those who find samsara unbearable and want to escape from it into the state of nirvana. They help others enormously by renouncing the world and striving to obtain freedom, but their main thought is personal liberation from samsara. An arhat—one who has completed this path of personal liberation—has many spiritual powers, and can give spiritual teaching and aid to many beings, but still has to remove jneyavarana. The attainment of nirvana will prove not to be sufficient and the arhat will then have to enter the bodhisattva path and progress through the ten levels to the final, complete buddhahood. Those who practise Mahayana also renounce samsara and want to escape from it. But because they identify with all other beings in samsara, Mahayanists do not want merely personal liberation. Through their great concern for others, Mahayanists' all-motivating wish is to give complete happiness to all beings. They understand first that all beings in samsara—insects, devas and the rest—are equal in that they all want happiness and do not want suffering. They also perceive that none of these beings has the satisfaction of complete happiness. For this reason, they develop the great wish to take all beings out of suffering. This wish, which is also a kind of caitta, is called mahakarunika, "the great compassionate one." Mahayana practitioners realize that all beings in samsara, though they may have transitory happiness, do not have true, lasting, happiness. The next wish, that of giving all beings the ultimate happiness of buddhahood is called mahamaitreya, "the great wish of active love." These wishes are stronger than the dissatisfaction of the Hinayana follower. Before this stage of aspiration is reached, there are many other practices that have to be developed so that Mahayanists can fully realize the suffering of beings. At first they want to bring all beings to enlightenment without any help. This is called adicinta, "the first thought." Then, when they examine themselves to see if they have enough power to do so alone, they find that the same defilements that other beings have exist within themselves as well. Thus they try to find who does have the power to help others in this way. Through this they find that only a buddha can do so, and develop the wish to reach the buddha stage quickly. This is bodhicitta 12, "the mind dedicated to enlightenment." When one has practised this a great deal, mahakarunika, mahamaitreya, adicinta and bodhicitta become part of the person's very nature. At this point the practitioner becomes a bodhisattva, though not yet an arya-bodhisattva—a very advanced bodhisattva, who has seen emptiness clearly. When the practitioner reaches the high state of a bodhisattva, all the devas pay respect. Once bodhicitta has arisen, the seed of Dharma will continue to grow whether the person is awake or asleep, and even very harmful karma can be prevented from ripening. Usually, people can remove mental defilements only by meditation on emptiness. Bodhicitta makes meditation on emptiness much more powerful. When a soldier is fighting an enemy he needs to use his weapon, but he also needs to have good food; bodhicitta is like this food. To reach the final goal we need two instruments: prajna (wisdom), and upaya (right means), which contains both compassion and compassionate activity. 13 Mahakarunika, mahamaitreya, adicinta and bodhicitta are all included in upaya. Prajna is seeing things as they really are. A bodhisattva must have both of these. Arhats, who have completed the Hinayana path, are out of samsara and have attained the lowest level of nirvana, are strong in prajna—in the realization of emptiness—but weak in upaya. They have compassion (karuna), but not the great compassion of mahakarunika. They have active love (maitri), but not mahamaitreya. The main difference between their path and that of the Mahayana is on the side of upaya. Eventually, arhats will have to develop it. Pandit Shantideva, in his Bodhicaryavatara, mentioned all the different virtues of bodhicitta, for those interested in knowing more about the mind dedicated to enlightenment. Mirror of Wisdom includes commentaries on the emptiness section of Mind Training Like the Rays of the Sun and The Heart Sutra. I personally feel extremely fortunate to have this opportunity to teach the Heart Sutra, otherwise known as the Perfection of Wisdom or the Wisdom Gone Beyond. I also feel that you, too, as participants in this teaching, are very fortunate. Why should we feel fortunate to be able to participate in this teaching? Firstly, this human life is extremely precious and very hard to achieve. Secondly, it is very rare that a buddha, an enlightened being, manifests as an emanation body in our world. Lastly, it is very difficult to come into contact with the Mahayana, or Greater Vehicle, teaching of Buddhism. Even though it is only under exceptional circumstances that all these factors come together, somehow we have been able to achieve it. We have this wonderful life with all its freedoms and potential for liberation and we also have the opportunity to follow the Greater Vehicle teaching of the historical Buddha, Shakyamuni. The Heart Sutra is special because by putting its teaching into practice it is possible for us to attain liberation from samsara, the cycle of existence, and to become enlightened within our own lifetime. Even though this is a short sutra, its meaning is extremely profound and we find a wealth of information within just a couple of pages. Take the time to reflect upon and contemplate the meaning. When we recite the HeartSutra, we shouldn't rush our recitation as if skating on ice. Instead, we should try to understand what each word means and should not be afraid to ask those who know more than we do when our understanding fails us. We will not gain much from the teachings if we listen with the sense of being coerced by some external force or authority. Only if we listen with our own inner spiritual enthusiasm can we listen fully. This enthusiasm flows from our understanding of the true value of the Dharma. When we ask, from the depths of our minds and hearts, what it is that we are truly seeking, then we can begin to realize the enormous value of spiritual practice in our present and future lives. Remember that meditation practice is far more important than simply reading Dharma texts. We shouldn't spend too much time reading books, but should try to meditate as much as possible so that we can internalize and actualize the meaning of the teaching within our mind-stream. It is primarily through meditation that deep experiences and realizations come. A poor person doesn't gain much simply by knowing how much a rich person owns. In the same way, an intellectual understanding of emptiness does not benefit us much if we don't put it into practice and meditate on it. Let us cultivate our altruistic intention, seeking enlightenment for the sake of liberating all sentient beings, who pervade limitless space. It is with this kind of motivation, the motivation of bodhicitta, that we should participate in this teaching. We have within us two types of buddha nature, or buddha lineage- our "naturally abiding buddha nature" and our "developable buddha nature." The naturally abiding buddha nature refers to the emptiness of our mind. As we engage in Dharma practice, we purify our negativities and accumulate wisdom and positive energy. It is through this practice that each of us can become a buddha. It is the emptiness of our infinite, all-knowing, or omniscient, mind that becomes the natural truth body of a buddha. This occurs when our mind is completely pure, free from defilements such as anger and pride and even of the imprints, or seeds, of those defilements. Our developable buddha nature is the infinite potential of our mind to grow and develop spiritually through listening to, contemplating and meditating on the teachings. When our mind is completely free of the two obscurations-the obscurations to liberation (deluded emotions, such as anger and desire) and the obscurations to knowledge (ignorance born from dualistic perceptions)-it transforms into the all-knowing mind of a buddha. Shakyamuni Buddha was born in India over two thousand five hundred years ago. After generating bodhicitta-the altruistic mind of enlightenment-for three countless aeons, he then thoroughly perfected the two types of accumulation that constitute the fruition of the entire Mahayana path, the accumulations of merit, or positive energy, and wisdom, or insight. Eventually, he became an enlightened being-a fully awakened person. Buddha performed twelve great deeds, but the most important deed of them all was turning the wheel of Dharma. Buddha gave the three great discourses that are known as the three turnings of the wheel of Dharma. The first wheel was turned in Sarnath and concerned the Four Noble Truths (aryasatyas). This teaching was primarily aimed at those who have the mental dispositions of the Hinayana, or Lesser Vehicle, practitioner. The third turning of the wheel was at Shravasti and concerned the characteristics of buddha nature. It was on Vulture's Peak, a mountain near Rajgir in the present day state of Bihar, where Buddha turned the second wheel of Dharma. His discourse concerned the Wisdom Gone Beyond (Prajnaparamita) sutras, which include the HeartSutra. Sutras and treatises deal with two types of subject matter-emptiness and the various levels of realization. The Heart Sutra explicitly presents emptiness as its subject matter and implicitly presents "the hidden levels of realization." The Heart Sutra is one of the most important of the Mahayana Prajnaparamita sutras. It is in the form of a dialogue between Shariputra, one of the Buddha's two closest disciples, and the bodhisattva Avalokiteshvara. The most extensive version of the Prajnaparamita sutras contains one hundred thousand verses; another contains twenty-five thousand verses, and there's also an abbreviated version eight thousand verses long. But the most concise version of the Wisdom Gone Beyond sutras is the Heart Sutra, which contains the innermost essence of them all. The sutras of Shakyamuni Buddha were not written down during his lifetime. However, when Buddha passed into parinirvana, final nirvana, there were many highly realized arhats and bodhisattvas who had great powers of mental retention, and they recorded everything the Buddha had taught about the Wisdom Gone Beyond. Buddha passed into parinirvana, the state of solitary peace, during a spring full moon, on the fifteenth day of the fourth lunar month, according to the Tibetan calendar. It was later, during a summer retreat, that the great council was held, where as many as five hundred arhats assembled together to write down Buddha's teachings. During the great council, the three master narrators of Buddha's works collected all of the teachings together. They are now found in the three divisions of the Buddhist canon, called the Three Baskets (Tripitaka). Mahakashyapa recalled all Buddha's teachings on higher knowledge (abhidharma). Then Upali narrated all the teachings given by Buddha on moral, or ethical, discipline (vinaya). Finally, Ananda, the Buddha's personal attendant, recalled and narrated all Buddha's teachings on the discourses (sutras). When they had gathered for the great council, all the arhats folded their yellow robes (chö-gö) together and placed them one on top of the other to make a throne. The principal narrators sat on this throne of robes and recalled all the teachings given by Buddha. When it was Ananda's turn to sit upon the throne, he faced in the direction where Buddha had taught the Prajnaparamita and the other sutras. He remembered Buddha so deeply that he wept as he began to narrate the sutras. Thus, when you read the words at the beginning of sutras such as the Heart Sutra, in "Thus I have heard...," the "I" refers to Ananda. In Sanskrit, the Heart Sutra is called Bhagavati Prajnaparamitahrdayam. The Tibetans retained Sanskrit titles in their translations for two reasons. Firstly, it is believed the buddhas of the past, present and future give their teachings in Sanskrit, so by reading the title in Sanskrit, we plant the seeds of the source language of Dharma in our minds. The second reason is to help us remember the great kindness of the lotsawas, whose name comes from the Sanskrit term meaning, "eye of the world"-the great translators who originally translated this and other sutras from Sanskrit into Tibetan. In order to understand the meaning of the Sanskrit title it is also helpful to know the Tibetan translation: Chom-den-de-ma she-rab kyi pa-rol-tu chin-pay nying-po. This line is actually an extremely concise statement of the doctrine of emptiness. It is regarded as the heart essence of the vast Prajnaparamita literature. Chom-den-de-ma relates to the word bhagavati in the title. Chom literally means "to destroy"; den means "to be in possession of remarkable qualities and realizations"; and de means "to go beyond." The Tibetan suffix -ma also relates to bhagavati and denotes that of the two aspects of Buddha's teaching, method (upaya) and wisdom (jnana), the Heart Sutra belongs to the mother-like, wisdom aspect. The first part of the title signifies the state of nirvana beyond the two types of obscuration, which I mentioned before. Prajna means "wisdom" and paramita means "perfection" or "gone beyond." Thus Bhagavati Prajnaparamita can be translated as "the possession of the wisdom gone beyond." The Sanskrit word hrdayam relates to the Tibetan nying-po, which means "essence," translated here as "heart." So, the meaning of the title suggests that this sutra is the heart of all other Wisdom Gone Beyondsutras. There are many kinds of wisdom but the Wisdom Gone Beyond sutra refers to the essential wisdom. This wisdom perceives the emptiness of true existence and thus the ultimate nature of all phenomena. It is with this wisdom that we can transcend ordinary levels of reality. Some other forms of wisdom include that arising from listening to teachings, the wisdom that arises from contemplating the teachings and the wisdom that arises from meditating on the teachings. These wisdoms can themselves be divided even further, but they are all only complementary or auxiliary wisdoms to help us generate and cultivate the wisdom that perceives the emptiness of true existence. Buddha said that it is because sentient beings have not realized that emptiness is the true nature of phenomena that they wander in the various states of cyclic existence. It is our delusions, particularly our ignorance, that keep us here in samsara. The root of all ignorance is our continual grasping at a self and it is this grasping that perpetuates our suffering. The wisdom that perceives emptiness is the direct antidote to this self-grasping and, as such, is essential in order for us to become liberated from the compulsive cycles of existence. Once we directly and nakedly realize the final and ultimate mode of existence of phenomena, we case to create new causes to return to samsara. The great Indian master, Aryadeva, in his treatise the Four Hundred Stanzas, clearly stated that even if one is not able to gain direct insight into the emptiness of all phenomena, merely by developing some positive doubt about the nature of reality, one can create a state of mind so powerful that it can shatter samsara. At the very least, if we think about and meditate on the meaning of emptiness every day, it will be of tremendous help in our spiritual growth. So, the Wisdom Gone Beyond refers to the wisdom that perceives emptiness, which itself is the very heart of wisdom. This teaching focuses on the profound view of emptiness (shunyata), which we find in the Wisdom Gone Beyond sutras. This kind of teaching is meant for both those who have not yet realized the emptiness of true existence and those who have, to help them further their understanding. It is difficult to fully understand emptiness, but we must make every effort to do so. It is only through gaining this understanding and experience that we can liberate ourselves from the suffering of samsara, particularly the suffering of the three bad migrations, the unfortunate realms of rebirth. If anyone thinks that by merely reciting a mantra they can liberate themselves from samsara, they are very mistaken. Likewise, simply cultivating great love, compassion and bodhicitta is not enough to completely remove delusion. Certainly, by reciting mantras and cultivating bodhicitta we can temporarily overcome manifest forms of delusion, but in order to eradicate delusion entirely, we must realize emptiness. The way to generate an unmistakable understanding of emptiness in our own mind is by studying and listening to teachings on emptiness from qualified spiritual masters. However, the text states that emptiness is beyond words, expression or thought. How can we study something that is beyond words, expression or thought? What this statement means is that emptiness cannot be explained or even talked about without taking into consideration conventional phenomena as a basis or reference. There is no way to speak about emptiness directly, so we speak about it through its relation to certain phenomena. Emptiness cannot be taught in the way that it exists for aryas in a state of meditative equipoise. Even they themselves cannot explain their experience to others. In the Sutra of the Ten Spiritual Grounds of Bodhisattva Realization (Dashabhumisutra), it is written that when aryas watch a bird fly they can see and understand the trail that it leaves in the sky. Most people can see only the bird, but aryas can somehow see the path that the bird is following. Similarly, aryas can see the trail-like emptiness of all phenomena. We cannot deal with emptiness in isolation. We have to talk about the basis upon which emptiness is established. For example, a wave is empty of true existence. When we focus our mind on the wave we see that the wave and the ocean cannot be differentiated. We see that they are dependent upon one another. The wave has no truly separate existence. In the same way, the experience of emptiness is non-dual, and in this state of non-duality our mind does not see the wave, only its emptiness. The wave then becomes the basis upon which emptiness as its ultimate characteristic is established. Everything exists dependently upon everything else. Nothing exists independently in and of itself. Therefore, everything is empty of inherent existence. Every phenomenon is empty of true existence, therefore emptiness is the ultimate nature of everything that exists. Emptiness is a characteristic that all phenomena share. Like the wave, the self, or "I," is also a basis, and emptiness is its characteristic. Emptiness is a very profound reality. We can understand this from the life story of the great master Lama Tsongkhapa, founder of the Gelug school of Buddhism. When he was in Central Tibet, he was deeply involved in intensive meditation. I mentioned before how once, while meditating on emptiness in the assembly of monks he was so absorbed that he didn't notice the other monks leave the assembly hall. I also explained how Lama Tsongkhapa reached such a high level of attainment that he was able to meet with the tantric deity of wisdom, Manjushri, and receive teachings directly from him. Remember how Manjushri informed Lama Tsongkhapa that he had not yet fully realized emptiness and that in order to do so he needed to accumulate more positive energy, so Lama Tsongkhapa went into retreat at Wölka and practiced intensive purification and accumulation, doing innumerable prostrations and mandala offerings. Realizing emptiness is no easy task. Even if we spend our entire life practicing meditation and reciting mantras, if we do not understand emptiness we cannot be liberated. We must realize that all the suffering we experience comes from the delusions in our minds. To cut through these delusions, we need the weapon of the wisdom that perceives emptiness. Lama Tsongkhapa has stated that when we have made ourselves suitable recipients through cultivating the common paths or practices, we will be able to enter confidently into the tantric vehicle-the point of entry for the achievement of enlightenment. Before we receive a tantric empowerment, there are three conditions that are required of us. First, we must have the sincere wish to be liberated. Second, we must have generated the altruistic mind of enlightenment. And third, we must have the wisdom that perceives emptiness. "Thus I have heard. At one time the Lord was sitting on Vulture's Peak near the city of Rajgir." It was out of Buddha's own deep experiences and realizations and his infinite compassion for all sentient beings that he gave his teachings. Buddha is an incomparable master. His body, speech and mind are completely pure of defilements and even the imprints of defilements. His body, speech and mind are the result of completion and perfection in the process of the accumulation of excellence, that is, of positive energy and wisdom. It is our knowledge of Buddha's qualities and realizations that helps us develop unshakable faith, confidence and trust in him and his abilities. The English translation of the text refers to the Buddha as "Lord." In the original Sanskrit this word is bhagavan, but it is more profound in the Tibetan translation, chom-den-de. As we mentioned earlier, the word chom literally means "to destroy." It is saying that Buddha has destroyed all defilements and the imprints of defilements. Den means "to possess excellent qualities and realizations"; de means to "go beyond" or "transcend." What this tells us is that in his enlightenment, Buddha has transcended the two extremes, which can refer to either the two types of obscurations or the two extremes of cyclic existence and solitary peace. This is why the Buddha is called chom-den-de. He is the destroyer of defilements, the possessor of excellent qualities and one who has gone beyond ordinary levels of reality. The honorific term bhagavan is also used to refer to other holy people, so the translators added the word de to the original Sanskrit to indicate that this wasn't just an ordinary bhagavan but a truly transcendent one. The city name of Rajgir literally means "the king's palace." This was where King Bimbisara, one of the Buddha's great royal patrons, lived. There are two interpretations given to the origin of the name of Vulture's Peak. Some people thought that the rock formations at the site looked like a flock of vultures. Others say that when Shakyamuni Buddha was teaching the Prajnaparamita sutras, the great bodhisattvas took the form of vultures when they came to receive the teaching. "He was accompanied by a large community of monks as well as a large community of bodhisattvas." This tells us something about the excellent assembly, those who were witnesses to Buddha's teaching. This teaching was explicitly intended for bodhisattvas and those with bodhisattva inclinations, even though there were also shravakas (pious hearers) as well as ordinary monks among the gathering. Emptiness cannot be taught to everyone, simply because not everyone has the capacity to understand it. As we find mentioned in the great Indian master Chandrakirti's work, Supplement to the Middle Way, a suitable recipient of the teaching of emptiness is someone who has already acquainted himself or herself with emptiness or teachings on emptiness and who is especially enthusiastic. There is an inner sign, an inner joy of the heart, which is sometimes expressed by tears rolling down the cheeks or by goose-bumps on the skin. Such a person has the right kind of mind to be able to comprehend the emptiness of true existence. Furthermore, based on their acquaintance with the subject of emptiness, such persons can grow spiritually to understand even deeper levels of realization. The English translation of the text simply refers to a large community of monks and bodhisattvas. "Monk" is the common translation of the Sanskrit word bhikshu, but bhikshu can refer to people of varying levels of spiritual accomplishment. It can mean a person who has received full ordination, who relies upon the food that is given in alms and who enthusiastically engages in the practices of abandonment and meditation. There are also arya, or superior, bhikshus- those who have gained direct experience of emptiness. This third kind of bhikshu is one who is already in a state of liberation and has become an arhat-a full destroyer of delusion. The core disseminators of Buddha's teaching were this third kind of member of the community of bhikshus-bhikshus who had already attained this profound realization. In the eight thousand verses of the Wisdom Gone Beyond sutra, we find that in the last community of monks before Buddha's death, all except one were arhats-completely free from contamination, defilement and delusion. The one exception was Ananda, the Buddha's personal attendant. Fortunately, Ananda achieved arhatship shortly before the great council was held. The text states that the Buddha was also accompanied by "a large community of bodhisattvas." The Tibetan translation of the Sanskrit word bodhisattva is jang-chub sem-pa." Jang literally means "pure of faults and defilements." Chub means "internally realized." Sem-pa is Tibetan for sattva. Sem means "to think" and pa means "to be brave." Taken together, the term literally translates to "hero." So a bodhisattva is a pure, realized person who thinks about the welfare of others and who works courageously towards the attainment of enlightenment for the sake of all, bravely cutting through the forces of negative actions. Another interpretation of the word sattva is "one who is heroic, courageous and patient in contemplation of the two truths-the conventional truth and the ultimate truth." In his Abbreviated Sutra, Buddha himself explained that sattva means "one who is generous, has great wisdom, is full of energy, has entered the path of Greater Vehicle Buddhism and has put on the armor of patience and tolerance and thereby combats the defiled states of mind." In the Tibetan text we find the phrase thab-chig-tu zhug-pa. This has been translated as "accompanied by" and refers to how people are seated or gathered together. Zhug-pa means "to sit" or "be together," while thab-chig-tumeans "a form of discipline." Thus, the termthabchig- tu zhug-pa means that the assembly was sitting together in the same disciplined state. "On that occasion the Lord was absorbed in a particular concentration called the profound appearance." The words "on that occasion" are not simply a casual reference to the time when this teaching was given. It means an auspicious confluence of events-a point in time when everyone's positive energy ripened and they became fully prepared to receive this teaching. "Profound" refers to profound emptiness and "appearance" here refers to the wisdom that perceives emptiness. Therefore, Buddha was involved in single-pointed concentration on the ultimate nature of reality, which was free from both coarse and subtle forms of laxity (drowsiness) and excitement (distraction). There isn't a single moment when Buddha isn't absorbed in this kind of meditative state. Lama Tsongkhapa said that this is because Buddha is constantly aware of everything that exists. In him, mindfulness is ever-present. However, Buddha is described as doing all sorts of other things such as eating, sleeping and so on. So, what is his state during these activities? It is said that a buddha doesn't need sleep. Nor is he ever hungry or thirsty. When a buddha appears thirsty, it is just because of the nature of our own perceptions. When Buddha went begging for alms, he wasn't really in need of food but was trying to inspire benefactors to create positive energy by giving and thus increase their own merit (punya). A buddha doesn't need to eat food because he already enjoys the food of concentration. "Meanwhile the bodhisattva, the great being, the noble Avalokiteshvara was contemplating the profound discipline of the perfection of wisdom. He came to see that the five aggregates were empty of any inherent nature of their own." The sutras were not necessarily spoken word by word. There are different kinds of sutras-blessed sutras, permitted sutras and spoken sutras-composed of words blessed, permitted or spoken by Buddha. These three kinds of teaching are not seen as contradictory and are all considered as teachings of Buddha. The Four Noble Truths constitute actual words spoken by Buddha himself, as do most of the teachings in the Prajnaparamitasutras. The Heart Sutra is generally considered to be a sutra presented through Buddha's permission and so it is a permitted sutra. But within the text we find passages that seem to dwell within the two other kinds, as when Buddha says, "well said, well said" to Avalokiteshvara. It is also a blessed sutra in the sense that Buddha blessed Shariputra and gave him the confidence to ask his question. We find innumerable bodhisattvas among the ten levels of bodhisattva realization. There are the eight close bodhisattva disciples of Buddha, for example. But of them all, it is Avalokiteshvara, Vajrapani and Manjushri who are considered to be the most important. Manjushri is the embodiment of the highest form of wisdom-that which perceives the emptiness of all phenomena. The unique quality of Vajrapani is that he is the embodiment of the enlightened power of all the buddhas. The word "noble" used in reference to Avalokiteshvara is a translation of the Sanskrit word arya, which has often been translated as "superior" or "transcendental" being. Avalokiteshvara, the embodiment of the compassion of all the buddhas, always keeps his eyes open to all sentient beings in order to liberate them from suffering and the causes of suffering and to endow them with happiness and the causes of happiness. Bodhicitta is the altruistic mind of enlightenment and the bodhicitta of Avalokiteshvara is said to be cowherd-like. Just as a cowherd doesn't rest until all the cows are safe in their shelter, so too has Avalokiteshvara promised that he will not rest until he has established all sentient beings in the mind of enlightenment. He is special because he represents compassion in its most intense and ultimate form. Avalokiteshvara's compassion is extended infinitely to all sentient beings. To him, all are equal rather than being separated into friends, adversaries and strangers. He is able to manifest simultaneously in innumerable forms. His mind is omniscient, understanding precisely and distinctly each and every aspect of phenomena and the qualities and characteristics of the paths and grounds leading to liberation and enlightenment. The text demonstrates that Avalokiteshvara understands that the five aggregates-the principal faculties that make up a sentient being-are all empty of true existence. "Through the power of the Buddha, the venerable Shariputra approached the noble Avalokiteshvara and asked him, 'How should a son of the noble lineage proceed when he wants to train in the profound discipline of the perfection of wisdom?'" Thus, absorbed in meditative concentration, Shakyamuni Buddha blessed and inspired his disciple Shariputra to ask Avalokiteshvara this question; that is, how should a person who wishes to follow the Mahayana path leading to enlightenment train his or her mind? "A child of the noble lineage" means someone who has the inclination of a bodhisattva or of Mahayana Buddhism. A Mahayana practitioner with keen intelligence and sharp mental faculties realizes emptiness first and then cultivates love, compassion and bodhicitta, the altruistic mind of enlightenment. One with slightly lower faculties cultivates love, compassion and bodhicitta first, and then studies and realizes emptiness. "The noble Avalokiteshvara replied to the venerable Shariputra, 'Whatever son or daughter of the noble lineage wants to train in the profound discipline of the perfection of wisdom should consider things in the following way. First, he or she should clearly and thoroughly comprehend that the five aggregates are empty of any inherent nature of their own....'"
Avalokiteshvara's answer tells us that from the Buddhist point of view, men and women are equal in being able to follow spiritual practice and gain spiritual realizations. Furthermore, every phenomenon-the house in which we live, the environment, in fact everything around us-has two truths, conventional and ultimate. When we shift the focus to ourselves, we see that we also have conventional and ultimate aspects. Once we know about the emptiness of forms, we can apply the same reasoning to the other four aggregates that make up our psycho- physical personality-feeling, discriminative awareness, compositional factors and consciousness, which are also empty of true or inherent existence. The crucial word here is "inherent." Of course the aggregates exist in a conventional sense but they do not exist in and of themselves. That is, they do not possess an objective existence. The line of philosophical reasoning is as follows. If a phenomenon were to exist in and of itself, it would not depend upon causes and conditions. If things did not depend upon causes and conditions, it would mean that results could occur without causes, which is impossible. "Form is empty but emptiness is form. Emptiness is not other than form and form is not other than emptiness. Similarly, feelings, discernments, formative elements and consciousness are also empty. Likewise, Shariputra, are all phenomena empty. They have no defining characteristics; they are unproduced; they do not cease; they are undefiled, yet they are not separate from defilement; they do not decrease, yet they do not increase." In the text we find that form is emptiness and emptiness is form. In other words, form is not different from emptiness and emptiness is not different from form. In his answer to Shariputra, Avalokiteshvara says that all phenomena are empty. This does not mean that nothing exists. What it does mean is that all phenomena are empty of something. That "something" is inherent, or objective, existence. The Heart Sutradoesn't explicitly mention inherent or objective existence-it simply states that "form is empty"-but this is the true meaning of emptiness. The text describes eight characteristics of emptiness, one of these being that phenomena have no defining characteristics. What this means is that phenomena have no inherently existing defining characteristics. So, when we contemplate this section of the Heart Sutra, if we conclude that nothing is produced and nothing ceases to exist, we are mistaken. The reality of phenomena is created by our perceptions and consciousness. Phenomena do exist and we cannot deny them. It is only inherent existence that does not exist. We know this because inherent existence is not apprehended to exist by any valid perception or state of mind. It is from this point of view that we speak of the self of phenomena and the self of a person as not existing. "They are undefiled" means that even afflictive emotions and the afflictions of delusions do not inherently exist. This is precisely the reason why we can rid ourselves of them. Everybody who is not free of defilements possesses delusions, which means that all of us are defiled. But where are these defilements? Do they have form or are they formless? If they had form it would be easy to take them out and remove them, but our defilements do not have form. We can't throw them away because they are a part of our consciousness. Yet these defilements cannot contaminate the absolute nature of our mind. If they did, then when we removed them we would also be removing our mind. Then, when we reached enlightenment, we would be without consciousness altogether. Therefore, we must understand that our defilements and our consciousness are not inseparable. When our clothes get dirty, the dirt is not the same as the cloth. When we wash our clothes it is the dirt that comes out. Our clothes remain intact. So remember, when we get rid of defilements we are not getting rid of our mind. When we engage in the activities of accumulating positive energy and wisdom, thus purifying our defilements, what we are really doing is purifying defilements onthe mind rather than inthe mind. In the line "yet they are not separate from defilement," we see how even the liberated side of phenomena, the freedom from defilements, does not inherently exist. Where it says "they do not decrease," we see that we have to work to develop qualities to decrease defilements or negativities. They do not diminish in and of themselves. The eight characteristics of emptiness presented here describe the "three doors to liberation." The first one presents emptiness as the door to liberation. The next five characteristics represent what we call "signlessness" (tsen-ma me-pa) as the door to liberation. The last two characteristics represent "aspirationlessness" (mön-pa me-pa) as the door to liberation. In Mahayana Buddhism, we present five progressive levels, or paths, of spiritual realization by which an aspiring bodhisattva travels towards enlightenment-the paths of accumulation, preparation, seeing (insight), meditation and no more learning. On the first two paths, those with bodhisattva inclinations are primarily engaged in listening to and contemplating the teachings on emptiness. As they progress along the paths of seeing and meditation, they begin cultivating the awareness of emptiness that arises through meditation. The obscurations to liberation and the obscurations to omniscience are the two main types of mental affliction that obstruct one's attainment of buddhahood and each of the five paths acts as an antidote to these obscurations. The path of accumulation. Within the path of accumulation we find three levels-the great, the intermediate and the initial, or small. At first, practitioners simply listen to the teachings. They do contemplate to some degree, but mainly they just listen. On the great, or advanced, level of the path of accumulation, it is possible for certain practitioners to actually ascertain or realize emptiness, at least conceptually. It is on this path that one gains the two collections of merit (virtuous actions) and wisdom. Although one has not yet gained any real clarity in relation to emptiness, one is clearly accumulating the necessary causes for that clarity. The path of preparation. There are four levels on this path-heat, peak, patience and supreme mundane qualities, or supreme Dharma. On these levels, practitioners comprehend emptiness conceptually. At the heat level, the meditator attains a clear conceptual awareness of emptiness within a meditative stabilization. The peak level marks a point at which the virtuous roots that have been cultivated previously will no longer decrease or be lost. At the patience level the meditator develops familiarity with the concept of emptiness and overcomes fear of it. When practitioners have reached this level and beyond, they are safe from falling into the three bad migrations, the unfortunate states of rebirth. At this stage, based upon their own valid reasoning, their conceptual understanding of emptiness is so powerful that they gain a deep understanding of the infallibility of the law of karmic actions and result. Even though they may have already-accumulated negativities, they cease to create fresh ones. At the level of supreme mundane qualities, the cognizing subject no longer appears while one is in meditative equipoise. Subject and object do appear, but the meditator no longer consciously perceives them. The path of preparation is also called the connecting path, as it connects us to the path of seeing. The path of seeing. As one progresses on the four levels of the path of preparation, one moves onto the path of seeing. It is while the meditator is on this path that he or she directly experiences emptiness for the first time. Here, one does not create any new karmic actions to cause rebirth in samsara. There is a quote-"seeing the truth, there is no precipitation"-which means that when one sees the ultimate truth of emptiness, just as a person with good eyesight will not walk off a cliff, one does not create any new karmic action that will precipitate one to be reborn into cyclic existence. The path of seeing is the first of the ten spiritual grounds of the bodhisattva, the remaining nine of which lie within the path of meditation. The path of meditation. On the path of meditation, when practitioners are in the state of meditative equipoise on emptiness, they experience it directly, with no duality whatsoever. The path of no more learning. This means that we literally have no more to learn. We have reached the state of perfection. We have reached enlightenment. The first thing with which we have to deal in our meditation on emptiness is identification of what is called in Buddhism "the object of negation" or "the object of refutation." The object of negation is the concept of the inherent existence of phenomena and the subsequent grasping at the existence of phenomena. As we find in the great bodhisattva Shantideva's Guide to a Bodhisattva's Way of Life, "Without coming into contact with the inherent thing, one cannot comprehend the absence of that thing." This means that without precisely identifying and recognizing the concept that you are refuting (the object of negation), you are not going to understand emptiness. After all, emptiness is established by way of refuting something. That something is inherent existence. The main purpose of meditating on emptiness is to be able to counteract grasping at inherent existence. This grasping is the other object of negation. If we don't understand what is being refuted, then even if we try to meditate on emptiness, our meditation will not counteract our grasping. We will be shooting an arrow without knowing where the target is. When we talk about the object of negation we are speaking of two kinds-one that exists and one that does not. To be able to identify the two types of object of negation, we have to check our perception and the habitual way we perceive things. For example, how do we perceive the self to exist? We perceive it to exist in and of itself. This idea of the inherent existence of the self is what we call a "non-existent object of negation"; our grasping at self is an "existent object of negation." We perceive and then we grasp. We use two different methods to deal with these two types of object of negation. We use authentic scriptural quotations to deal with the object of negation that does exist and valid reasoning to deal with the one that does not. Thus, we should try to imagine how we individually perceive the self to exist and where we perceive it as existing. Once we recognize the fallibility of the idea of a self, it is easy to recognize how we grasp at other phenomena. But in order to be able to understand the nonexistence of the self, we first have to know what we mean by the term "inherent existence." What are the criteria by which we judge whether something exists inherently? First, it should exist independently; second, it should not rely upon causes and conditions. Does the self exist this way? Upon analysis we can see that it does not. The self exists dependently. It is dependent upon the collection of our five physical and mental aggregates. This is the first level of how to meditate on emptiness. "This being the case, Shariputra, in terms of emptiness there exist no forms, no feelings, no discernments, no formative elements, no consciousness..."
Remember that Avalokiteshvara is explaining how to train the mind in the perfection of wisdom. The key point is that while we are on the path of meditation, what exists for us in the state of meditative equipoise on emptiness is just emptiness and nothing else. Conventional phenomena do not exist for that kind of wisdom. We do not even perceive the basis upon which emptiness is established. We perceive emptiness directly, nakedly and non-conceptually. When one first begins to meditate on emptiness, one also perceives the conventional phenomena that are the basis upon which emptiness is established. Eventually, our perceptions become like "water poured into water"-undifferentiable from one another. We no longer experience any duality existing between our perceptions and they become of "one taste." This is why we say that all conventional phenomena have been exhausted for aryas in the state of meditative equipoise on emptiness. What Avalokiteshvara means when he says "in terms of emptiness there exist no forms" is that conventional forms do not exist in this state. It is common for people to fall into the extreme of nihilism and misinterpret this as meaning that forms do not exist at all. This is as mistaken a view as the extreme of absolutism, or eternalism. If a person is not receptive or "ripened" they can easily misconstrue the meaning of emptiness. There is a story of a mahasiddha, a great Indian master, who took shelter from the midday heat in the carcass of an elephant. The elephant's insides had been eaten by worms and its body was empty like a cave. The mahasiddha meditated here and gained direct experience into emptiness. One day, the local king invited the mahasiddha to his palace and asked him to teach about emptiness. The mahasiddha entered a deep meditative state and started pointing at things saying, "That doesn't exist, this doesn't exist, they don't exist." He wasn't denying the existence of phenomena; what he meant was that nothing exists inherently, in and of itself. But his audience completely misunderstood him. The king became very angry and sentenced the mahasiddha to death. Just as forms do not exist for an arya's wisdom in meditative stabilization on emptiness, so the remaining aggregates-feelings, discriminative awareness, compositional factors and consciousness do not exist for such wisdom. When we read this statement we must understand that we are not denying the conventional existence of the five aggregates but just their inherent existence. We can see that the aggregates exist dependently, arising as they do from certain causes and conditions. "...no eyes, no ears, no noses, no tongues, no bodies, no minds; no visual forms, no sounds, no smells, no tastes, no tactile sensations, no mental objects. There exist no visual elements, no mental elements, and no elements of mental consciousness." As you recite the Heart Sutra and come across these lines, you must understand that what is being stated here is that none of these things exist for the wisdom of an arya in a state of meditative equipoise on emptiness-especially on the path of meditation. In the Heart Sutra, we find eighteen elements of phenomena. There are six objects, six faculties and six perceptions, all of which are empty of true existence. Emptiness pervades all phenomena. For example, when we are directly perceiving the emptiness of the true existence of eyes, we are only perceiving the basis upon which the eyes exist, but not the eyes themselves. Visual forms, sounds, smells, tastes, tactile sensations and mental objects are the six objects, or objective conditions, of the six faculties. The six faculties are eyes, ears, nose, tongue, body and mind. Visible form is an object of eye consciousness, sound is an object of ear consciousness, smell is an object of nose consciousness, taste is an object of tongue consciousness, touch is an object of tactile consciousness and thought is an object of mental consciousness. The six faculties are the basis for the arising of a particular consciousness. For example, the eyes are the basis for the consciousness that perceives visual forms. Sometimes we speak of the twelve sources. These refer to the six objects and the six faculties combined. The twelve sources give rise to the six perceptions of seeing, hearing, tasting, smelling, touching, and thinking. "Source" is the English translation of the Tibetan word kyeche, meaning "that which gives rise to" and "door through which things are perceived," as well. "There exist no ignorance and no exhaustion of ignorance, no aging and death and no exhaustion of aging and death." This sentence refers to the chain of twelve dependent links, or the chain of dependent origination. This describes the process by which we are continually falling into cyclic existence. This chain or sequence of events begins with 1) ignorance and follows with 2) karmic formation, 3) consciousness, 4) name and form, 5) sensory fields, 6) contact, 7) feelings, 8) attachment, 9) grasping, 10) becoming, or existence, 11) birth and 12) aging and death. Buddha has pointed out the need for us to understand and meditate on the twelve dependent links in both sequential and reverse order. In sequential order we are seeing the afflictive side of phenomena -that which pulls us into cyclic existence, or samsara. In reverse order we see the unafflictive side of phenomena-that which liberates us from cyclic existence. Contemplating the twelve links in sequential order, we gain insight into the limitations of cyclic existence; contemplating them in reverse order, we learn how to liberate ourselves from cyclic existence. 1) Ignorance. The first link is ignorance (ma-rig-pa). Ignorance is the root cause of cyclic existence. It misperceives the self of a person and the reality of all phenomena and causes us to grasp at ego and material things. But the wisdom that perceives selflessness sees the emptiness of the self and all other phenomena. Ignorance and selflessness contradict each other. It is very important to individually focus on our own ignorant grasping at self and to know that this root delusion gives rise to all others. All problems stem from this root-the ignorant grasping at self, or I. This is the real troublemaker in our lives. To be able to fight the tendency to grasp at a self we have to prepare our minds through study and practice of the three higher trainings-training in higher ethics, higher concentration and higher wisdom. Training in higher ethics lays a firm, solid foundation on which to build our other practices. Monks and nuns have their own ethics to keep, but even people who haven't taken any vows should refrain from engaging in negative actions, particularly the ten negative actions. Having laid a foundation of ethics, one can then practice in the higher training of concentration. Just as a woodcarver needs strong arms to cut wood, we need to develop the strong arm of concentration through mindfulness and introspection. Without mindfulness and introspection, our meditation will be very weak and ineffectual. Once we have cultivated concentration, we need to cultivate wisdom, particularly the wisdom perceiving emptiness. This is our superior weapon; with it we can cut through the grasping at self. It is our woodcutter's ax, with which we can chop through our dense forest of ignorance. All of our spiritual activities, no matter what they may be, should be geared towards destroying our habitual grasping at self and cultivating the wisdom perceiving emptiness so that we can experience ultimate reality. In the pictorial representation of the wheel of life, ignorance is depicted as a blind man, walking without any guide. Such a person is always uncomfortable and confused wherever he or she goes. Ignorance prompts us to create karmic actions that then become the cause of all our problems and suffering. Just as a blind person moving towards a precipice is certain to fall, whatever actions spring from ignorance are bound to bring about problematic results. Buddha made the statement, "Because this exists, that arises." In the same way, because ignorance exists, karmic formation naturally follows. 2) Karmic formation. The second link is karmic formation (du-che kyi lä). Karmic actions arise out of ignorance and are capable of precipitating our rebirth into samsara. There are two kinds of ignorance, that pertaining to the infallibility of the law of karmic actions and result and that pertaining to the ultimate reality of phenomena. Ignorance of the law of karma motivates us to do negative, or nonmeritorious, actions. These actions ripen in cyclic existence, especially in the three unfortunate states of rebirth-the hell, hungry ghost and animal realms. Ignorance related to misunderstanding the ultimate nature of reality can make us do karmically positive or neutral actions. Positive actions stemming from this type of ignorance can ripen within fortunate states of rebirth-in the human, demigod or deva realms. In the drawing of the wheel of life, this link is depicted as a potter rotating his wheel. It is karma that spins and molds us in cyclic existence. 3) Consciousness. The third link is consciousness (nam-she). There are two kinds of consciousness-causal and resultant. Causal consciousness exists with the performance of a karmic action. As that action- good or bad-comes to an end, it leaves an imprint on our consciousness. The consciousness that receives that imprint is the causal consciousness. Resultant consciousness is activated by an imprint, or latency, that was deposited earlier on. The consciousness that enters the womb of a mother is an example of this. It is the consciousness that arises as a result of certain karmic actions in the past. Say, for example, that out of ignorance we kill someone and don't purify that action. The action leaves an imprint on our consciousness, which thus becomes a causal consciousness. Some day this imprint will precipitate an unfortunate rebirth; the consciousness that goes towards that conception is the resultant consciousness. In the wheel of life, consciousness is shown as a monkey. When a monkey inside a house with windows on all four sides looks out each window it sees different views, but it is still the same monkey. Similarly, it is our single consciousness upon which imprints of our karmic actions are deposited and then activated at different times to bring about certain results. This is how we are born into various states in cyclic existence. 4) Name and form. The fourth link is called "name and form" (mingzug). Those born from the womb (as opposed to those born through miraculous power) possess the five aggregates that constitute the psycho-physical personality. The first aggregate is "form." The remaining four-feelings, discriminative awareness, compositional factors and consciousness-are called "name" because they do not have the concrete quality of form. Form is considered to begin when the consciousness enters the womb and absorbs into the mixture of sperm and egg. In the wheel of life, the dependent link of name and form is depicted as a boat. Just as we need a boat to cross a river, in order to cross over into a physical being in cyclic existence we depend on name and form. 5) Sensory fields. The fifth link is called "origination" or "sources" (kyeche). As I mentioned before, there are twelve sense fields altogether- one for each of the six senses and one for each of the objects of the six senses, including mind. There are eye and visual forms seen, ear and sounds heard and so forth. In the wheel of life, this dependent link is represented by a fortress because our senses encompass and concretize our experience of the world. 6) Contact. The sixth link is called "contact" or "touch" (reg-pa). It refers to the interaction of an object, a sense faculty and a consciousness. Before this contact, although our faculties are fully developed, we cannot perceive anything or distinguish one thing from another. Only when there is a union of these three things can perception or discriminative awareness occur. When there is a meeting of attractive object, sense faculty and consciousness, a pleasant feeling arises. Similarly, when there is a contact of unattractive object, sense faculty and consciousness, an unpleasant feeling is experienced. In the wheel of life, contact is depicted iconographically by a man and woman in sexual union. 7) Feelings. Contact naturally gives rise to the seventh link of feeling (tsor-wa). We talk about three types of feelings-pleasant, unpleasant and neutral-all of which arise from some kind of contact. When we see something, there follows a sense of attraction or aversion and a value judgment about what we are seeing, which stimulates these feelings further. In the wheel of life, feelings are represented by a man with an arrow stuck in his eye. This describes our sensitivity and how, when feelings arise, we notice them immediately. 8) Attachment. Feelings precipitate the eighth link, attachment, craving or desire (se-pa). When we experience a pleasant feeling, we desire to not be separated from it. When we feel trapped in a problem, we experience the desire to be free from it. In our everyday life we experience all sorts of feelings. It is possible to have feelings without attachment, but the feelings we are talking about here are the kind that stem from ignorance. If we eliminate ignorance, we will experience feelings without attachment. Not surprisingly, attachment is depicted in the wheel of life as a person indulging in intoxicating liquor. In some treatises, attachment is likened to someone scratching an itchy skin irritation-it feels pleasant at first, but it is actually creating the conditions for more and more itching. 9) Grasping. Attachment gives rise to the ninth link, grasping (len-pa), which is an intensified form of attachment. There are four kinds of grasping-grasping at sense objects (forms, sounds, smells, tastes and tactile objects); grasping at wrong, or distorted, views; grasping at improper ethics and disciplines, seeing them as worthy; and grasping at the inherent existence of the five aggregates. In the wheel of life this dependent link is depicted as a person picking fruit. 10) Becoming, or existence. Grasping gives rise to the tenth link, becoming, or existence (si-pa). A karmic action leaves an imprint on our mental consciousness. At the time of death, that imprint is activated by craving and grasping. In this way, the karma becomes fully prepared to precipitate the next rebirth and a being about to be reborn feels a powerful attraction towards its future parents, who are about to engage in sexual union. 11) Birth. The eleventh link is rebirth (kye-wa). It occurs from this fully ripened karmic action. In Buddhism, rebirth is considered to have taken place when the consciousness enters the womb of the mother at conception and later culminates in the act of physical birth. 12) Aging and death. The final link is aging and death (ga-shi). Aging begins from the moment of conception. Death is technically defined as the complete exhaustion of the aggregates, when the life energy, or life force, comes to an end. The dependent link of birth necessarily gives rise to aging and death, and if one dies under the power of karmic actions and delusions one is necessarily born under their influence. Yet, if someone born from delusions and contaminated karmic actions becomes an arhat and attains liberation, such a person does not die under the influence of delusion, and his or her rebirth is not influenced by them. Precipitating causes—ignorance, karmic formation and causal consciousness. These are the links that instigate our rebirth into cyclic existence. Ignorance is like a farmer, karmic formation is the seed sowed by the formation of ignorance and causal consciousness is likened to a field. Accomplishing causes—craving, grasping and becoming. Just as water, manure and sunlight prepare the seed for growth, in the same way, craving, grasping and becoming activate the karmic action and prepare it to bring about its result. Precipitated results—resultant consciousness, name and form, sources, contact and feelings are brought about by the accomplishing causes. Accomplished result—aging and death. When we study the twelve dependent links in reverse order we are really trying to reverse the entire process. We are trying to put an end to aging and death by preventing birth and trying to put an end to ignorance, which stops the whole cycle from repeating. What uproots ignorance is the wisdom realizing emptiness, and when ignorance is eliminated, karmic formation does not arise. The whole purpose of studying and meditating on emptiness is to break this chain of twelve dependent links. "In the same way there exist no suffering, no origin of suffering, no cessation, no path, no wisdom, no attainment and no lack of attainment." Neither suffering, the path, attainment nor the lack of these things truly exist for an arya's wisdom in the state of meditative equipoise on emptiness. Even the wisdom that realizes the Four Noble Truths does not exist for this wisdom. We must not misinterpret "no attainment" to mean that we cannot attain buddhahood or the qualities of a buddha. We can. It simply means that this attainment does not exist for an arya who is in a state of meditative stabilization because in this state he or she sees only emptiness and not conventional phenomena. There also exists no lack of attainment, so neither does failure appear for this kind of wisdom. "Therefore, Shariputra, since bodhisattvas have no attainment, they depend upon and dwell in the perfection of wisdom; their minds are unobstructed and unafraid. They transcend all error and finally reach the end point: nirvana." This passage deals with the path of meditation in general and the meditative stabilization of a bodhisattva on the final stage of the tenth ground in particular. This vajra-like state of meditation becomes an antidote to the last obstacle to enlightenment. What is meant by "they depend upon and dwell in the perfection of wisdom" is that bodhisattvas are completely free from any fabrications when absorbed in the nature of emptiness, being completely engaged in that state. When we talk about purifying negativity, we find two kinds of defilement-coarse, or gross, and subtle. Just as the coarse dirt on our clothes is easier to wash away, coarse defilements are easier to get rid of. Subtle stains penetrate our clothes more deeply and are harder to clean away; the final obscurations to omniscience, even though the smallest in magnitude, are the toughest to eradicate. We need the most powerful weapon to destroy them. This weapon is the vajra-like meditative state. "Their minds are unobstructed and unafraid" tells us that such bodhisattvas, having trained their mind in stages, from the path of accumulation all the way up to the final stage of the tenth bodhisattva ground, have abandoned many of the obscurations along the way, including fear. Then comes the phrase, "They transcend all error." We talk about four kinds of error, sometimes called the "four distortions"-perceiving that which is impure as pure; perceiving that which is painful as pleasurable; perceiving impermanent phenomena as permanent; and perceiving that which is selfless as having self. Bodhisattvas are free from these errors and also from the error of the two extremes-solitary peace and cyclic existence. When we emerge from the vajra-like meditative state, we achieve the liberated path and attain the final enlightenment of buddhahood. This state is described by the Sanskrit word nirvana, which means, "beyond distress" or " beyond sorrow." These are the sorrow and distress of the solitary peace of personal liberation and the sorrow and distress of cyclic existence. Nirvana refers not just to personal liberation but to complete enlightenment as well. Buddha's great compassion prevents him from falling into the extreme of solitary peace. If he did, he wouldn't be able to work continuously for the benefit of other beings. Like the bodhisattvas, he also has the fully developed perfection of wisdom and is thus free from cyclic existence. Foe destroyers, arhats of the Lesser Vehicle, who have liberated just themselves from samsara, are still trapped in solitary peace and, unlike bodhisattvas, cannot work for the welfare of other sentient beings. "All the buddhas of the past, present and future have depended, do and will depend upon the perfection of wisdom. Thereby they became, are becoming and will become unsurpassably, perfectly and completely awakened buddhas." From this we understand that the perfection of wisdom is the universal path trod by all the buddhas of the past, present and future. The perfection of wisdom is also referred to as the Great Mother because it gives birth to the buddhas of the three times. In both Buddha's sutras and tantras we find skillful means, or method (upaya), referred to as father-like and wisdom (jnana) as mother-like. This wisdom gives birth, metaphorically speaking, to the three different states of liberation-those of the hearers, solitary realizers and bodhisattvas. "Therefore, the mantra of the perfection of wisdom is a mantra of great knowledge; it is an unsurpassable mantra; it is a mantra that is comparable to the incomparable; it is a mantra that totally pacifies all suffering. It will not deceive you, therefore know it to be true!" In both sutra and tantra, the word mantra has the same connotation -protecting the mind. Practitioners who practice mantra are protecting their minds from fears and danger. The perfection of wisdom fulfills the same purpose. It is called a mantra here because when we cultivate the wisdom gone beyond, this practice also works to protect us from fear and danger. The perfection of wisdom is "a mantra of great knowledge" in the sense that of all the various kinds of wisdom, it is the greatest-the real antidote to ignorance. The mode of apprehension of ignorance is incompatible with the mode of apprehension of the wisdom of emptiness, which directly contradicts the grasping at self. It is "unsurpassable" inasmuch as we cannot find any other wisdom that has such power to free us from both suffering and its causes. The perfection of wisdom leads us to the non-abiding state of enlightenment, and because of this it "is comparable to the incomparable." Another interpretation of this passage can be related to the five paths. "Therefore the mantra of the perfection of wisdom" relates to the path of accumulation; "Is a mantra of great knowledge" relates to the path of preparation; "It is an unsurpassable mantra" relates to the path of seeing; "It is a mantra that is comparable to the incomparable" relates to the path of meditation; and "It is a mantra that totally pacifies all suffering" relates to the path of no more learning, or enlightenment. The five paths of the Greater Vehicle are differentiated from one another from the point of view of wisdom, or insight, not from the point of view of method, or skillful means. The way in which everything actually exists-the ultimate nature of phenomena -is the way that it is perceived by the perfection of wisdom. It is this perception that can take us to the state of enlightenment. As we train our minds in the perfection of wisdom, we should do so together with the practices of the other five perfections, or the skillful means of method. We should not isolate wisdom from method or method from wisdom. If we do not practice the two together, we will never achieve enlightenment. The integration of method and wisdom is essential. The importance of this was expressed well by the first Dalai Lama in his praise to Lama Tsongkhapa when he said, "Integrating method and wisdom together, you have actualized the three enlightened bodies. Most glorious spiritual master, please bless me." By practicing method and wisdom on the five paths, we can abandon all obstacles and finally reach the state of non-abiding enlightenment. "I proclaim the mantra of the perfection of wisdom, TAYATHA GATE GATE PARAGATE PARASAMGATE BODHI SVAHA. Shariputra, it is in this way that the great bodhisattvas train themselves in the profound perfection of wisdom." The Heart Sutra can be condensed from a Mantrayana or tantric Buddhist point of view into the one-line mantra, TAYATHA GATE GATE PARAGATE PARASAMGATE BODHI SVAHA. The word TAYATHA means, "it is like this." GATE means "go" as an exhortation. So GATE GATE means "go, go," meaning that we should go onto the path of accumulation and then go further onto the path of preparation. PARAGATE literally means "go beyond" and PARASAMGATE means "go thoroughly beyond." It is telling us to go beyond the paths of accumulation and preparation and onto the paths of seeing and meditation towards supreme enlightenment. The first GATE or "go" is for beginners with Mahayana inclinations, those practitioners who haven't yet entered the Mahayana path but who are cultivating compassion and the perfection of wisdom. It means go to the path of accumulation of the Greater Vehicle. When practitioners spontaneously and naturally experience bodhicitta, they have already entered the Mahayana path of accumulation. The second GATE also means "go." When practitioners have gone to the path of accumulation they should go on to the next path, which is the path of preparation. It is on this path that practitioners can conceptually understand emptiness. Practitioners who have traversed the paths of hearers or solitary realizers may have already realized emptiness directly when they enter the path of Mahayana. When we have reached the path of preparation we should go beyond to the path of seeing. When we reach the path of seeing we are already on the first spiritual ground of bodhisattvas. We are then told to "go thoroughly beyond." We should not get stuck on the path of seeing but go higher up onto the path of meditation. BODHI is enlightenment and SVAHA means to become stabilized in the state of enlightenment. So the meaning of the entire mantra is, "It is this way: Go, go, go beyond, go thoroughly beyond, go to enlightenment and become stabilized there." "At that moment the Lord arose from his concentration and said to the noble Avalokiteshvara, 'Well said, well said. That is just how it is, my son, just how it is. The profound perfection of wisdom should be practiced exactly as you have explained it. Then the tathagatas will be truly delighted.' When the Lord had spoken these words, the venerable Shariputra and the bodhisattva, the great being, the noble Avalokiteshvara, and the entire gathering of gods, humans, asuras and gandharvas were overjoyed, and they praised what the Lord had said." When Avalokiteshvara and Shariputra finish their dialogue, Buddha rises from his meditative state. He authenticates the words of Avalokiteshvara and congratulates him on his presentation of the perfection of wisdom. His explanation delights not only Buddha himself but all the enlightened beings of the ten directions and the buddhas of the three times. After the teaching, everybody in the gathering committed themselves to following the perfection of wisdom, while others who were not yet ready made fervent prayers that they would soon be able to do so. The life stories of Buddha and other enlightened teachers shouldn't be regarded as just interesting tales but should be seen as practices for us to follow and paths by which we can grow spiritually. Buddha stated that compassion is the core of his teachings. This compassion should be all-pervasive and non-discriminatory. We should minimize harmful actions towards others and try to increase the scope of our compassion to bring more and more people and sentient beings into its fold. We also need to cultivate the determined wish to be liberated and develop a true aspiration for enlightenment. It is not so hard to aspire to be liberated from the problems of cyclic existence, but we need also to have the same wish in reference to samsara's prosperity and happiness. Pain in cyclic existence does not last but neither does pleasure, so we should not cling to samsara's temporary marvels. To be true Dharma practitioners, we must consider our future lives to be more important than the present one. We should consider others to be more important than ourselves and spiritual activity to be more important than worldly activity. Of course, all these things will come to us gradually. We need to train our mind in stages before we can experience this kind of change in attitude. Remember that all good things happen to us through the kindness of others. It is only in relation to other sentient beings that we can do our practice. If sentient beings didn't exist, we couldn't practice at all or create the positive energy and positive actions through which we receive peace and happiness. Thinking in this way, we can see the kindness of all sentient beings. As Dharma practitioners, our practice involves two things- purifying our negativities and accumulating positive energy and wisdom. You can do these things in relation to the Three Jewels, sentient beings or both. Therefore, experienced lineage masters who have deep spiritual understanding tell us that sentient beings are as kind to us as Buddha himself. This might seem inconceivable at first, but in terms of the inspiration for our practice there is little difference between them. Normally, although we may accept certain sentient beings as being kind to us, we also become selective. We exclude those who have been bad to us and include only those whom we consider worthy. But if we exclude some beings, then logically all others should be excluded as well. We must create a sense of equanimity, a balanced attitude, in relation to all sentient beings-friends, adversaries and strangers. If we really want to work for the benefit of others, it is essential to cultivate great compassion. For those who wish to pursue the path of the bodhisattva in Mahayana Buddhism, it is as important to cultivate great compassion and altruism as it is to cultivate the perfection of wisdom. It is not very difficult to generate compassion for ourselves, but it is a great deal harder to cultivate the same compassion for others. Yet this should be our goal, however hard it may be. Let us dedicate our positive energy to the flourishing of Buddhadharma throughout the world. Let us dedicate our positive energy to the long life of His Holiness the Dalai Lama. May his sacred mandalas of body, speech and mind be unharmed by negative intentions and actions. May he and other great masters be successful in fulfilling their dreams and visions for benefiting all sentient beings. Let us dedicate our positive energy to all spiritual communities throughout the world, so that they may flourish in their study, contemplation and meditation. Let us dedicate our positive energy to the elimination of the problems in our world, such as famine and war. May everyone in this and other world systems experience peace, happiness and harmony. Let us dedicate our positive energy to ourselves and to other Dharma practitioners, so that we may overcome all obstacles to spiritual development. Let us dedicate our positive energy to ourselves and to all sentient beings, so that we can purify the obscurations to liberation and omniscience and quickly reach enlightenment. By Khen Rinpoche Lama Lhundrup in Kopan Monastery, Nepal, December 1987. Khen Rinpoche Lama Lhundrup, former abbot of Kopan Monastery, gave this teaching on the eighteen root bodhisattva vows at the 20th Kopan Course, held in December 1987. Khen Rinpoche Lama Lhundrup, former abbot of Kopan Monastery, gave this teaching on the eighteen root bodhisattva vows at the 20th Kopan Course, held in December 1987. The teaching is translated by Ven. Tsen-la and lightly edited by Sandra Smith. You can read a Prayer for the Quick Return of Khen Rinpoche Lama Lhundrup by Kyabje Lama Zopa Rinpoche on the LYWA website. A copy of the Bodhisattva Vows is available from the FPMT Foundation Store. This is a brief exposition on the bodhisattva vows. Whether we reflect on things from the point of view of self or from the point of view of others—whatever point of view we have, our main objective is to achieve enlightenment at any cost. As explained in the lam-rim teachings, the suffering nature of our existence in samsara and its causes are the result of our own selfish attitude or self-cherishing mind. The conclusion or the main essence of the lam-rim teachings is to generate a strong motivation—the strong thought to benefit sentient beings at all costs. The reason for this essential conclusion is that all our happiness, including the smallest, is solely due to the kindness of others. The benefit we can accomplish is to fulfill what others wish and repay their kindness. What others want at all times is happiness and what they don't want is suffering and pain. Just as it is for others, it is also the same for us, and as it is for us, it is the same for others as well. We learnt in the teachings on the graduated path to enlightenment that to find happiness and to eliminate suffering, the responsibility belongs to us completely. Although we have complete responsibility for fulfilling all the happiness of others and eliminating all their suffering, we do not have the potential to fulfill this at the moment. Is it possible for me to actualize or to attain such potential? We can achieve this potential. Is a person with such potential a possible phenomenon in the world? This is also a possibility. Who can we identify as such a person? That would be the Buddha himself. If we put in the effort, we can achieve such a state ourselves, because we can accumulate the causes for this result, enlightenment. In order to achieve the result of enlightenment, we need to train in the methods to achieve it. The main method to achieve enlightenment is bodhicitta, the altruistic aspiration towards enlightenment generated out of the mind of compassion. Bodhicitta, the altruistic mind seeking solely the welfare of others, needs to be enhanced limitlessly. It is not enough just to habituate our mind, and generate or cultivate the altruistic mind in our meditation—besides generating the altruistic mind, we also need to actually venture into the deeds of such a mind. The main deeds of bodhisattvas, the beings who have bodhicitta, are the observation of a high code of ethics. How quickly or slowly we achieve enlightenment is solely dependent on how purely we observe the bodhisattva vows. These vows need to be received or taken from a lama and then all the various aspects of the vows need to be observed. 1. Praising ourselves and belittling others. If we have received bodhisattva vows and engage in actions such as praising ourselves with the desire to achieve material things or respect and so forth—if we have that kind of intention, and the view of gaining things that glorify our qualities and put down others—when we have bodhisattva vows and undertake such an action, then we break the root vow. This is a very brief explanation of the first vow. This is one of the most dangerous vows, because we are likely to break this vow very easily due to our strong, self-cherishing mind. There is a danger of breaking this vow very often because of our selfishness, and also because we very easily disparage others, including our guru, when we see the slightest faults or mistakes in them. 2. Not giving material aid and Dharma. This vow is usually broken when we are miserly. When we have an abundance of material things and somebody asks for material aid due to their great poverty or lack of something, but we refuse, then we accrue the second transgression. If we have no sense of miserliness, but refuse to give because it may cause obstacles or hindrances to our Dharma practice, then under these circumstances, not giving is validated. Secondly, there is miserliness regarding teaching Dharma. We feel miserliness over imparting these teachings and we also feel lazy to explain the teachings sometimes. That's the second way to break the vow. The only circumstances when it is valid not to give teachings is when this would not benefit someone but would cause harm, and in that case we can refuse to give teachings. Generally, in giving Dharma teachings, the kind of people that we should teach are those with much aspiration and enthusiasm towards the teachings. 3. Not forgiving others, and even if someone apologizes, not listening to an apology. The third vow is broken, for example, when we fight with somebody and that person apologizes afterwards or gives us a material present, but we refuse to listen out of anger, upset feelings or hatred. If we hold a grudge and refuse to accept a material gift or listen to an apology, then we break the third vow. So, for these sets of vows it is essential not to hold onto anger or a grudge after we have had a fight or disagreement. If we hold onto a grudge or anger, then it is difficult to accept an apology later on. 4. Abandoning the Mahayana Dharma. The downfall of abandoning the Mahayana Dharma is accrued in circumstances such as when we are engaging in Mahayana practice and later we decide, “I might as well train in the Shravaka path, or the Hearer’s path, which is a faster way of attaining arhatship.” We abandon Mahayana Dharma under these circumstances. 5. Taking offerings which are meant for the Buddha, Dharma and Sangha. This occurs when we take for ourselves offerings made to the Triple Gem. This includes materials to make a statue or to print scriptures or to make clothes for statues. Of the three types of offerings, if we use offerings made to the Sangha for ourselves, no matter how small they are, then the karma is very heavy. It is said that if we take offerings made to the Buddha and the Dharma, the negative karma can be completely purified, but if we take offerings made to the Sangha, even if we purify, some result has to be experienced despite the purification. It can be something as minor as picking a flower, a twig or a leaf from the garden. We are taking that which has not been given to us. This means abandoning the practices and teachings belonging to the Hearers’ Vehicle, the Shravakas, the Solitary Realizers’ Vehicle or the Mahayana Vehicle. We see one or other of these teachings as not being suitable for our practice. We may say, for example, “What's the point of meditating on the whole lam-rim? I might as well just do the breathing and contemplate on the mind. That's all!” Even just saying that is abandoning Dharma. 7. Causing an ordained person to disrobe. This vow includes things like, for example, taking away robes that belong to monks, or causing someone else to take the robes away. 8. Committing the five immediate negativities. We commit these “immediate negativities” when we kill our father, mother or an arhat, cause a Buddha to bleed, or cause disharmony within the community of the Sangha. Holding wrong views refers to believing in the non-existence of cause and effect, past and future lives, and the non-existence of the three objects of refuge and so forth. 10. Destroying towns, cities or places where many people are living. We break the tenth vow if we intentionally destroy a town or city. Whether we start some sort of fire or use water or other means, we have the intention of destroying that whole town or city. 11. Teaching the profound teachings to those who are not fit receptacles. An example would be somebody who is on the bodhisattva path and when we expound the teachings on emptiness, the person gives up or turns away from the Mahayana path. Instead of helping the person progress, we cause that individual to regress. That would be an example of teaching the profound to someone who is not ready. 12. Turning someone away from complete enlightenment. The twelfth downfall occurs when, for example, somebody has full aspiration towards complete enlightenment and we influence the person by saying that there is not much benefit, and that it is better to work for our self-liberation through either the Solitary Realizer's path or the Hearer’s path. If we influence the person to turn away from full enlightenment through our talk, we incur this twelfth downfall. 13. Encouraging others to abandon the self-liberation vows. The transgression occurs when we tell people that the self-liberation vows, such as the monks’ and nuns’ ordination vows, are not necessary. We tell people to just study the Mahayana Dharma and generate bodhicitta. If we talk and influence people in this way, we incur the thirteenth downfall of abandoning self-liberation vows. 14. Causing others to hold distorted views. To differentiate the first root downfall from the fourteenth, the fourteenth one mainly arises out of a jealous mind, as the other person is getting so many enhancements, and that is causing our own downfall. We are losing out by the other person gaining and we feel unbearable jealousy over that, so it mainly has its base in jealousy. 15. Expressing a great form of lies. This downfall means telling profound lies and saying we have realizations when we don't. An example of the fifteenth root downfall, the expression of profound lies, is when we haven't realized emptiness, but we say, "I have realized emptiness, so I am going to teach you this emptiness out of my experience." 16. Taking material things that belong to the objects of refuge. An example of the sixteenth vow is when we intentionally fine someone who is ordained so that we gain material things. The sixteenth vow refers to any property that belongs to the Buddha, Dharma and Sangha. We either forcefully confiscate or take away property belonging to the objects of refuge, or we influence or cause someone else to take the property away. If we have a fight or a duel, or something like that, we take things belonging to the objects of refuge. The next vow is putting together rules or disciplines that are not valid. An example of this downfall is when a gelong is practicing very purely and we make certain rules and regulations that would disrupt his progress. We do this out of jealousy for that person who is doing his practices purely, and in order to distract him away from his meditation. Lama Lhundrup: How many have we got? Eighteen? Lama Lhundrup: Seventeen? We missed out the fourteenth one, which is disrespecting or criticizing the Hinayana teachings. Then, the other one is abandoning the bodhicitta mind. Does that make eighteen? What happened? No, I think it’s eighteen. 1. Praising yourself and belittling others. 2. Not giving material aid or teaching the Dharma. 3. Not forgiving someone who has previously offended you. 5. Taking offerings to the Three Jewels. 6. Despising the Tripitaka and saying these texts are not the teachings of Buddha. 8. Committing any of the five heinous crimes. 9. Holding views contrary to the teachings of Buddha. 10. Completely destroying any place by means of fire, etc. 11. Teaching shunyata to those who are not yet ready. 12. Turning people away from working for full enlightenment. 13. Encouraging people to abandon their vows of moral conduct. 14. Causing others to hold distorted views about Hinayana teachings. 15. Practicing, supporting, or teaching the Dharma for financial profit and fame while saying that your motives are pure, and that only others are pursuing Dharma for such base aims. 16. Telling others even though you have very little or no understanding of shunyata, that you have profound understanding of shunyata. 17. Taking gifts from others and encouraging others to give you things originally intended as offerings to the Three Jewels. 18. Taking away from those monks who are practicing meditation and giving it to those who are merely reciting texts. Lama Lhundrup: This is not very good—there are things missing. Are there eighteen now? Lama Lhundrup: Most are okay, most are correct. Right? These are the eighteen root downfalls. If you observe these eighteen root vows purely, then the forty-six auxiliary vows are already included in these root eighteen vows. There are four main conditions that have to be fulfilled in order to incur the complete transgression of a root vow. The first of these conditions is having broken a vow before and still wishing to break it in the future. Secondly, we are not able to abandon that downfall and we wish to pursue the downfall again. Thirdly, we feel very happy to break the vow and we don’t see any faults or disadvantages to our actions. Lastly, we don’t have any sense of shame or consideration for others. If these four points are present, there is complete transgression of the root vow. We explained these eighteen root downfalls very briefly, but if we explain them elaborately, each vow branches out into many, many different points. Two of these eighteen vows do not require the fulfillment of all four conditions in order to incur the full transgression. These two vows are giving up bodhicitta and the generation of wrong views. These two vows do not require all four conditions to be present for complete transgression. The moment you give up or totally disregard bodhicitta, that naturally causes the root downfall, without the presence of any of the four conditions. Also, the generation of wrong views is powerful enough to cut off the continuum of virtue. So, these two vows do not require the presence of the four conditions, but the remaining sixteen require the presence of all four conditions in order to incur the full downfall. If all four conditions are not present, we incur only the shortcoming of breaking that particular vow. Of these four conditions, if we have one point that says if we don’t see the fault or the harm in that transgression, we have a medium level of contamination. Literally it’s called “medium contamination,” and we have only a partial transgression as opposed to a full transgression. If we engage in one of these root downfalls and we see the faults or the shortcomings of undertaking that course of action, we incur only a small contamination. If we have this particular condition but do not have the other three conditions, by being aware of the fault in this action, it becomes only a small shortcoming. Having understood these eighteen root downfalls, because they can be so easily accrued, if we constantly familiarize ourselves with the shortcomings, then it helps us to avoid engaging in them so easily. The fourth condition—having a sense of shame or consideration for others—refers to the fact that if we engage in a particular transgression, we will experience the expected, ripening result, and having that awareness, we try to abstain from that negative action. That is having a sense of shame. Also, if we have consideration for others in the sense that if we engage in a particular negative action, then others will come to know of it and the Buddha will know of it. We abstain from the negative act out of consideration for others. These two points are essential for practicing Dharma. If we have a strong sense of shame and consideration for others, then we do not easily incur the transgression of vows. So, it is essential that we observe this sense of shame and consideration. Do you have any doubts or questions about these points? Lama Lhundrup: Yes, it is very easy. When we study and meditate on the graduated path to enlightenment, the first and foremost point is renunciation, in order to realize the shortcomings of cyclic existence. If we are attached to our possessions or the pleasures of this life, there is no way to generate renunciation, and if we do not have renunciation, there is no way to generate compassion, and without compassion there's no bodhicitta. Okay, you can use for others. Your motivation is for others, not for your selfish motivation but for others. Eating chocolate “I eat for beneficial all mother sentient beings.” All right? Okay? So then for the whole day if you want chocolate, you have no problem. All right? Yes, it depends on your mind. It looks easy. If you have control of your mind, then okay. Right? Simple. Student: What happens when vows overlap? For example, walking up to Kopan Hill, many people ask me for one rupee, but the rupees in my pocket are to study the Dharma. How does that work? Lama Lhundrup: I think, okay. Student: Which one? To give the rupee or to buy the lessons of Dharma? Lama Lhundrup: Maybe you can first buy lessons for the Dharma, then later you can give to the world. All right. Student: So there is a priority? Lama Lhundrup: Yeah, yeah, yeah. Otherwise, you cannot get opportunity to listen to Dharma. All right? Lama Lhundrup: Yes, that’s you can see, nuclear, atom bomb. Lama Lhundrup: Because we have a strong selfish mind. We still have the vows, but there is also that strong selfish mind. So when somebody is destroying, disturbing us and doing very bad things to us, so then we get very angry. So then anger makes us want to do many incredible, bad things. We cannot control ourselves. 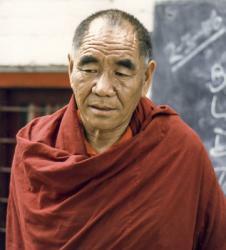 Lama Lhundrup: Some beginning ordinary being can take these kind of vows, yes, no problem. Yes, they can take. Lama Lhundrup: Military, army? Possible. Some people first take the vows, then somebody puts them in the army, but they can do like that. Lama Lhundrup: If by telling the truth, then you destroy the other person, then maybe you can somehow change the words. The bodhisattva can do this kind of lying, if it is really beneficial. They can tell a lie if it is beneficial for them. With a motivation of compassion we can lie. Otherwise, when we lie we destroy their own peace. Yes, by our motivation, motivation is very important, all right? So then okay, you can say. Lama Lhundrup: You can say this, but after you have conception, Oh, I told Mum lying, so then after night time you have purification. All right? Lama Lhundrup: You can try to just have the motivation, to try never to kill any sentient beings. “I don't kill animals”, you just have that motivation, you can say like this. So it doesn’t matter if you can just have this kind of motivation, then if you [accidentally] kill an animal, you don't have the motivation for killing. But if you see a dead animal then you can do something for them such as saying OM MANI PADME HUM. Whatever you do for them is beneficial. Lama Lhundrup: If you took bodhisattva vows then you can do sessions for whole your life, you become the Mahayana path, yes. This is more comfortable. Lama Lhundrup: That’s difficult. What example you can tell me? Why giving back? Reasons? Lama Lhundrup: That kind if you have some good reasons, then you can ask guru and if guru says okay, then you have. Yes. Lama Lhundrup: Root or what? Maybe you can say what. Lama Lhundrup: If we have a strong bodhicitta motivation, then these seven nonvirtuous actions of the body and speech2 are allowed in the case of bodhisattvas, who have bodhicitta. They have an exemption over these nonvirtuous actions depending on the circumstances. In this case, we are talking about people who have spontaneous, genuine, intuitive bodhicitta. They have exemption from these seven nonvirtues of body and speech. We are not talking about somebody who just has it verbally or by making effort. It is not an exemption for those who do not have bodhicitta; it is an exemption for those who have bodhicitta. These people are allowed to do these actions under circumstances that will give the most benefit. In our undertaking of a particular nonvirtuous action, we should feel completely tolerant of any result that we might incur. Lama Lhundrup: There's no harm in that particular one because there is no truly existent Christianity and therefore we can see Christianity and Buddhism as oneness in nature, because the essential point of Buddhism is non-violence, or not giving harm. That is the essential point. It is concordant with Christian philosophy and it is the main point of Buddhism too. So we abide in that nature, in that point. Lama Lhundrup: If we have a teaching from Christian teachers and it is a way of developing ourselves and developing our bodhicitta, then we can still practice it. If, instead of developing us, it undermines us and degenerates our mind, then we have the wisdom to differentiate. Student: So, the very broad meaning of practice is simply practicing bodhicitta, practicing to develop your mind? That’s all? Lama Lhundrup: Yes, true mind, true bodhicitta, true love, that's all. Thank you. Okay, thank you very much. A teaching by Geshe Lama Konchog on applying the force of right effort to our practice given at Amitabha Buddhist Centre, Singapore. 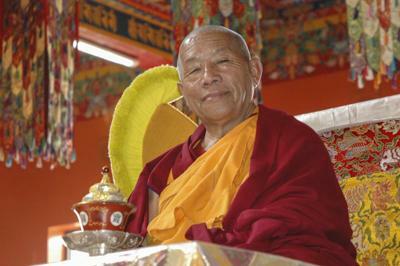 Geshe Lama Konchog discusses the application of right effort to our practice. This teaching covers a range of topics including suffering in this life, generosity, the fasting retreat, the hungry ghost realm and bodhisattvas in cyclic existence. The teaching was given by Geshe Lama Konchog at Amitabha Buddhist Centre, Singapore in 1995. Transcribed and edited by Ven. Thubten Konchog, who accepts responsibility for all errors and omissions. Second edit by Sandra Smith, February 2013. This teaching is also available for download as a free e-book from Amitabha Buddhist Centre, Singapore. Lama Tsongkhapa has said the superior thought, or bodhicitta, is like a sail to a ship. If the sail is not blown by the wind, the boat cannot move or travel anywhere. So, although we may have this superior thought or bodhicitta, if it is not blown by the wind of effort, the ship of hearing and contemplation cannot move. Therefore, without right effort, sentient beings cannot cross the ocean of cyclic existence and reach the city of liberation or enlightenment. Effort is the best amongst all the friends and listlessness is the worst of all the enemies. If the force of effort is applied, even the tiniest insects and animals can attain the state of full enlightenment. We are human beings, so we have the power of wisdom to be able to discriminate between what is to be abandoned and what is to be practiced. We know the benefits of virtuous actions and the faults of non-virtuous actions. We have discussed this kind of power, this potential, so we should never become discouraged by thinking, “I won’t be able to reach enlightenment.” Instead we should think, “I can definitely attain enlightenment. I have the power, I have that potential.” By thinking this way, we can generate the courage to be able to work in a better way towards the attainment of enlightenment. We may think that this is just too difficult, but it is possible to reach enlightenment. However, there are many hardships to overcome along the way. This could mean that we have to make sacrifices, even of our body. If we are afraid to do this, it will be most difficult to attain enlightenment, because we are unable to discriminate between heavy and light sufferings. From beginningless lifetimes we have taken many types of form. We have taken a life where we were tortured daily, or where our limbs were cut and injured or maybe even sliced into many pieces. However, compared to the sufferings that we have experienced in the hell realms, the sufferings or problems we are encountering now on the way to the state of enlightenment are nothing, or perhaps they are only very small. All the sufferings that we have experienced in the past have been completely wasted. If those sufferings had been a cause for enlightenment for ourselves and others, then they would have been meaningful, but they did not help us to attain enlightenment, or even to awaken our minds, so they were completely wasted. The sufferings that we experienced in the lower realms, such as the hells, were very intense and had to be experienced for a very long time compared to the sufferings that we are experiencing now. By abandoning the purpose of working only for this life and instead, working for the attainment of enlightenment, the hardships and difficulties that we encounter along the way to enlightenment are nothing compared to the sufferings of the hell realms. The sufferings that we experience now are very small and they can be endured. In fact, they are very easy to endure. An example of this is a doctor who treats his patients for serious illnesses. In order to remove the illness he might have to take blood from the body and test it. Some doctors might use a fire to burn a part of the body, or they may give injections. All of these kinds of treatments bring some form of harm or suffering, yet they will result in the relief of the severe illness in the long run. So, even though we know we are suffering now, we can endure it by thinking that we will benefit from it. The sufferings that we encounter on the way to enlightenment are the sufferings of hardship, but they are comparatively small compared to the sufferings of the hell realms. In order to remove the sufferings of cyclic existence, we have to bear them. If we can endure the suffering we are experiencing now—the suffering of travelling on the path to enlightenment—then we will eventually be able to eradicate the immeasurable suffering, not only of ourselves, but also of others. Some very skillful doctors are able to treat their patients without causing them any pain. The Buddha also gives many different methods for us to be freed from suffering and from encountering many difficulties. Sometimes we encounter so many difficulties that we cannot bear another minute. Now, if you are unable to endure such hardships, I want you to stop for one minute. If we are not familiar with the practice of giving, we should not do it right away. We should not give away things that will cause us to endure suffering. First of all, we should give away small things until we have become familiar with giving and then gradually start giving bigger and bigger things. Later, when we become comfortable with giving, we can give even of ourselves—our limbs and flesh. This will be just like giving somebody a portion of food. In order to attain the state of enlightenment, we must apply the right methods. The Buddha said that these are not the methods used by ordinary doctors who cause pain to relieve diseases, but rather he showed us methods that free us from the sufferings of cyclic existence. These are the methods of abandoning the two extremes and abandoning the delusions, both of which cause us to wander in cyclic existence. There are not too many hardships that we will encounter while we travel on the path to enlightenment, so there is no need to be frightened or to feel fear while travelling along that path. In the beginning, it is a very difficult path to travel along. To engage in the deeds of the bodhisattvas we may be asked to sacrifice our limbs, our heads or our hands. To have fear of these hardships would make it very difficult for us to ever attain enlightenment. Shantideva says that we do not have to undergo such hardships. If we are not familiar with suffering and are unable to bear it, then we should not have to do so. We can stop until we become completely familiar with a practice, then we will be able to do it easily. In this way there will be no hardships at all. Initially, if we are unable to make big sacrifices, such as giving away big and valuable things, we should start with small things, such as a small portion of food, or things that are not held so importantly. Then very gradually we can progress to where we are totally familiarized with giving and then we can offer anything easily—even our own flesh. When the Buddha gave teachings on using effort, he said that when we apply right effort there is no hardship. By applying right effort, the mind is then able to do things very gently and with great delight. For example, if we apply right effort when doing the sessions in the fasting retreat, we will experience no hardship. However, if we apply no effort and we do not have the mind that delights in performing virtuous deeds, then just doing one session will be the cause for much hardship. If there is no effort, there will be hardship, but if there is right effort, it will be very easy. For example, if while doing the session we think, “Oh, my visualization is not very good. I cannot sit straight and I feel very sleepy,” and so on, there will be many hardships during that session. If we apply right effort and try to do everything with delight, then it will not feel like a hardship. When we do the fasting retreat, we are told we will incur the karma to be reborn in the pure realm of Amitabha. Just thinking this way should be enough to stop any difficulties from arising, for example, by remembering this, how can we feel upset about not eating any food for one day? However, this all depends on our state of mind. It is only from our mind that we experience suffering or happiness. For instance, during the fast in the retreat we should not stretch out our legs or arms, nor should we sleep with outstretched legs or arms. If we go back and sleep after finishing a session, we will feel hunger later on and will have difficulty sleeping that night. This can bring other problems such as headaches, fever or it can even be a cause for hepatitis. Sleeping in between sessions can bring many problems. If we really are very tired, we can lie down for awhile, but then we should stand up and walk around. If we think that we will sleep only for a very short time, then that is OK. However, if we just lie down and go to sleep after every session, then that is no good at all. If we go to sleep during the daytime, we will feel very bad when we finish the fasting retreat and will never want to do it again. However, if we do not sleep in the daytime, at night we will have a very nice sleep and in the morning we will feel very refreshed and then we will feel quite happy about continuing on. As I said before, the Buddha was very skillful when he taught us how to practice generosity. He taught how to give away the small things that we do not hold so much attachment to. We should do this because if we give with miserliness we can’t give delightfully and then there is no right effort, as well as no generosity . Miserly people can be taught to practice giving, for example, even if we cannot give to others, we can give to ourselves. For instance, if we have a thing in our right hand, we can give it to our left hand and then the left hand can give it to the right hand, and so on. This creates no problems because we are not really losing that thing. Even though we are giving, we are still receiving. However, doing this causes us to feel the delight and happiness of giving and receiving; the practice of generosity. We may very well think that it is not too difficult to give to ourselves, but for some people this is very difficult. Some people just cannot give anything at all. Some people cannot even give away the things that they cannot use themselves, they keep them at all times. There are some types of beings who find it very difficult to give even a cup of water to others. These kinds of people will take rebirth in the hungry ghost realm. The hungry ghosts have three kinds of knots in their throats and it is very difficult for them to swallow food or water. They have been born as hungry ghosts because they could not give anything to other people and they could not even use those things for themselves either. Some people cause trouble by telling others who are trying to give something: “Oh, you should not give so much. That is far too much!” Or even: “You should not give anything at all!” By saying these things to others, we will take rebirth in the hungry ghost realm with the three knots in our throat. Only one drop of water can go down the throat of a hungry ghost, because of the three knots. When lamas make torma offerings to hungry ghosts, they say: “...and I give you one drop of water,” because they can only swallow one drop of water, and if they take more it will cause many problems in their stomachs. These hungry ghosts always say: “Don’t give a lot; give a little.” They recite this every day, just as we recite mantras. If we are not skillful in practicing the Dharma or in actualizing the path, things will become very difficult and we will have to endure many problems. However, if we practice with right effort, we will have no difficulties at all. When we know how to do the fasting retreat, we will have no problems and we will do it very happily. Therefore it is most important to know how to do it in the right way. Bodhisattvas actually reside in cyclic existence, but this does not upset them. They do not feel any suffering, because they know how to live very gently. There is no rebirth for them while they reside in cyclic existence. They are not born into cyclic existence by the force of karma and delusions; they are here by the force of compassion. Their birth is very different from ours and they do not have any regrets about being in cyclic existence, so it is for this reason that the bodhisattvas of the Mahayana path are superior to the hearers of the Hinayana path, as the hearers do not have this compassion. Whenever the hearers take birth in cyclic existence, they do so out of karma and delusion. They have fear of undergoing the suffering of cyclic existence, so they cannot be encouraged to travel on the path of the bodhisattvas. When bodhisattvas sacrifice their bodies out of compassion, they do not feel any form of suffering. They have abandoned all unwholesome actions of the three doors, so they have no suffering in their mind. Bodhisattvas are those beings who have reached the higher level—they have reached the third ground of the third bhumi. They experience no suffering, even when their bodies are cut into pieces. This is true also for the high tantric practitioners. Even if somebody beats them with a stick, they do not experience any pain. This all depends on the mind. Here I am explaining the application of right effort. Bodhisattvas make this kind of sacrifice and experience no suffering, because they do it all very happily and joyfully. The reason they experience no pain is because they do not hold the misconception of grasping at the self and they have not incurred any negative actions such as killing, etc. They do not have the concept of “my” body. Once there was a bodhisattva called “The Always Crying Bodhisattva.” He wanted to go and receive teachings from another bodhisattva, who was his teacher. This bodhisattva was teaching on the Perfection of Wisdom Sutra. While he was doing this, he did it with such joy and also with great compassion, by thinking it would help him attain enlightenment for the sake of all sentient beings. Therefore, he did not feel any suffering or any regret because he possessed the realisation of bodhicitta and great compassion. The Always Crying Bodhisattva always seemed to be very poor, because he did not have any material things. Actually, he was not poor; he was very rich with the realization of emptiness and bodhicitta. The reason he was always crying was because of not being able to see his teacher, not because he did not have any material things. Milarepa also used to stay in a very poor condition. When people looked at him, they would feel most upset for him, thinking that he had a very ugly form. His condition was caused by eating too many nettles; his body had become green like the nettles. People thought that he was very skinny and very ugly and they thought he did not own anything, so they felt very sorry and upset for him. But Milarepa felt very sorry and upset for them, because they thought he was very poor and skinny. Milarepa felt most upset for sentient beings, because he thought that sentient beings incur so much negative action just for the clothing and food of this life, and for that amount of negative action, they have to wander endlessly in cyclic existence. Due to the power of bodhicitta, bodhisattvas can expel the non-virtues that they have incurred in the past and they can store the accumulation of merit and wisdom easily. This is why the bodhisattva path excels over the path of the hero.